Art plays a major role in this Long Branch condo—in paintings and in elements of the furnishings. Above the living room sofa, a large work in shades of blue represents “ocean, horizon, calm,” designer Jeff Acker says. 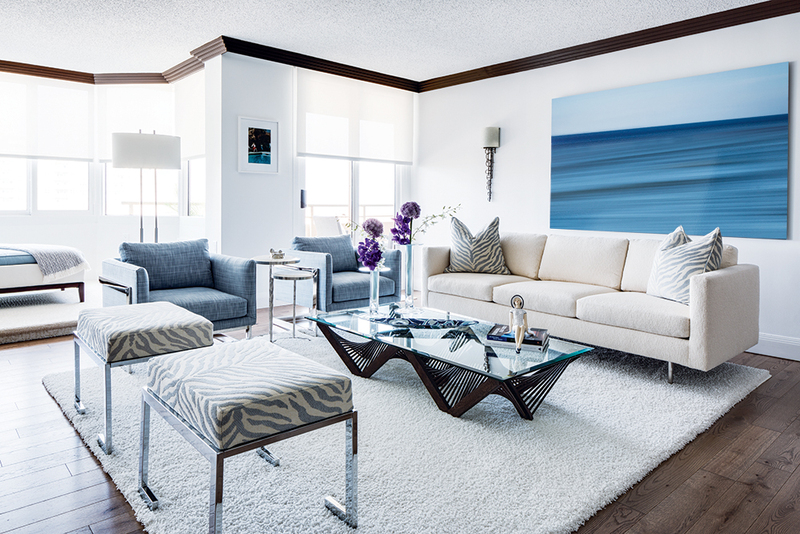 The sofa, chairs and zebra-patterned stools in shades of white and blue perch atop chrome legs to create a floating feeling in the living room. The brown hardwood floor—reminiscent of driftwood—and chocolate brown molding warm up the space visually, while a cocktail table with a sculptural base of wood dowels adds an artful touch. The homeowners wanted a peaceful area in the living room to relax and enjoy views of the ocean. The living room windows, however, don’t extend to the floor allowing for those views. Designer Jeff Acker brought the views into line by creating a raised platform and furnishing it with a custom chaise. Natural grass cloth with a light blue cast covers the walls in the condo’s octagonal foyer. 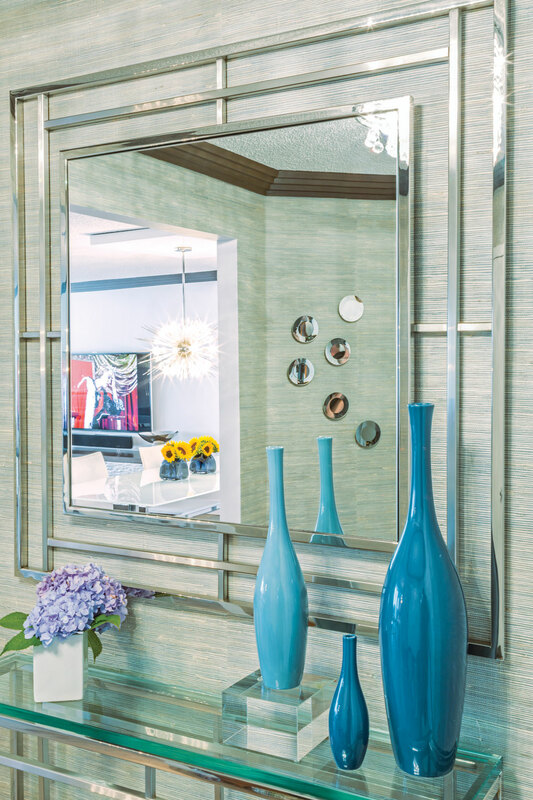 The reflective quality of a silver console table and mirror—along with decorative beveled mirror disks on the walls—create an impression of the sun reflecting the ocean. Varying textures add depth to the white dining room. 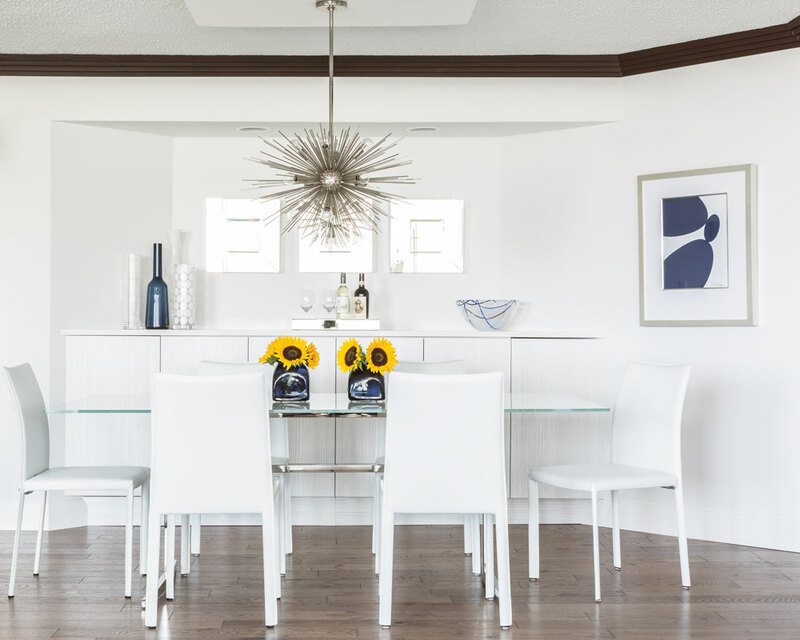 The dining room table is white glass, the chairs are leather, the custom sideboard is lacquer and the starburst light fixture is polished chrome. 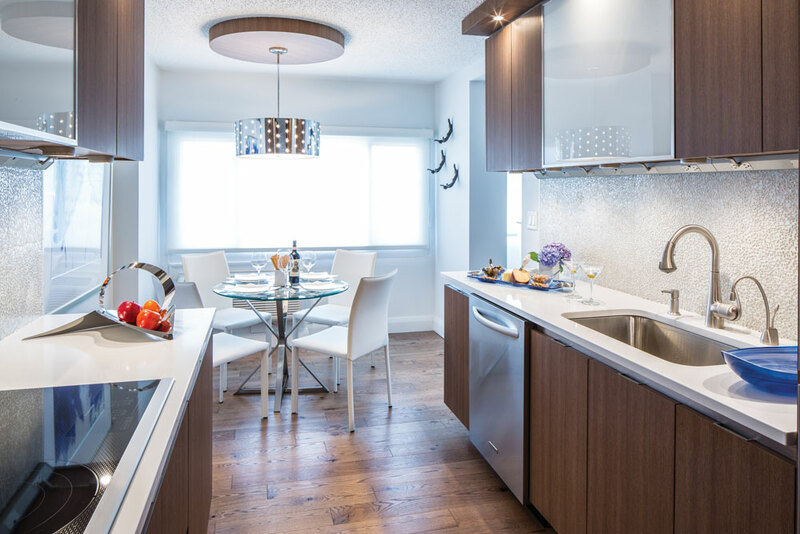 Contemporary walnut cabinetry with a textured grain plays off a sparkling white glass mosaic backsplash and white quartz countertops in the kitchen. The cabinetry has the look of driftwood while the backsplash is reminiscent of white sea glass. In the breakfast room, the designer chose the same kind of white leather chairs as he used in the dining room so the owners have additional seating when entertaining. The breakfast room also features a play of textures thanks to leather chairs, a glass and chrome table, and a polished chrome light fixture with small crystals around the perimeter. Acker designed a large round soffit above the table to conceal a misplaced junction box in the concrete ceiling. The aura of a luxury hotel reigns in the master bedroom with a focal wall featuring a tone-on-tone textured wall covering and overhead soffit housing recessed lighting for soft drama. The upholstered and tufted headboard is off-white Ultrasuede. The designer ripped out the master bathroom’s old whirlpool and replaced it with an 8-foot-long shower covered in gleaming 12-by-24-inch white tiles. The same tiles are used on the other walls and floor to create a serene atmosphere. The countertops are white quartz while the vanity is a weathered light taupe wood. The guest room’s twin beds are backed by upholstered blue linen panels that extend from floor to ceiling. They serve as headboards and create a distinctive look for an otherwise plain space. Just off the living room, the porch overlooks the ocean and has ceramic porcelain tile flooring that mimics the look of the living room’s hardwood floor. Woven rattan furniture has durable white Sunbrella cushions. A Monmouth County beachfront condo offers fresh, contemporary interiors that appear to float between sky and ocean. 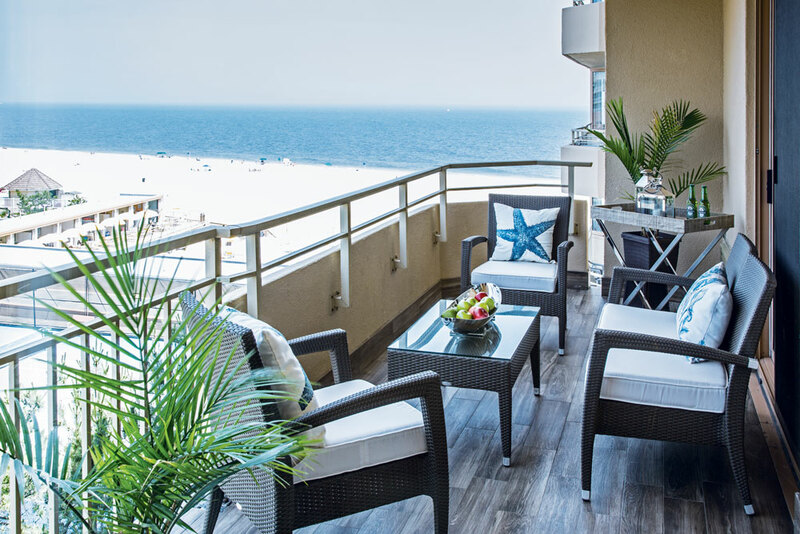 Nearly every room of this Long Branch, NJ condo in a beachfront high-rise affords breathtaking views of the sky above and the ocean below. “You look out the windows and feel the sky, the horizon, the sand and the ocean. The whole condo gives an ethereal feel of floating,” says Jeff Acker, a member of the International Interior Design Association and partner in Acker Bryant Design in Deal, New Jersey. Acker took that aura as the inspiration for his complete re-do of the condo. 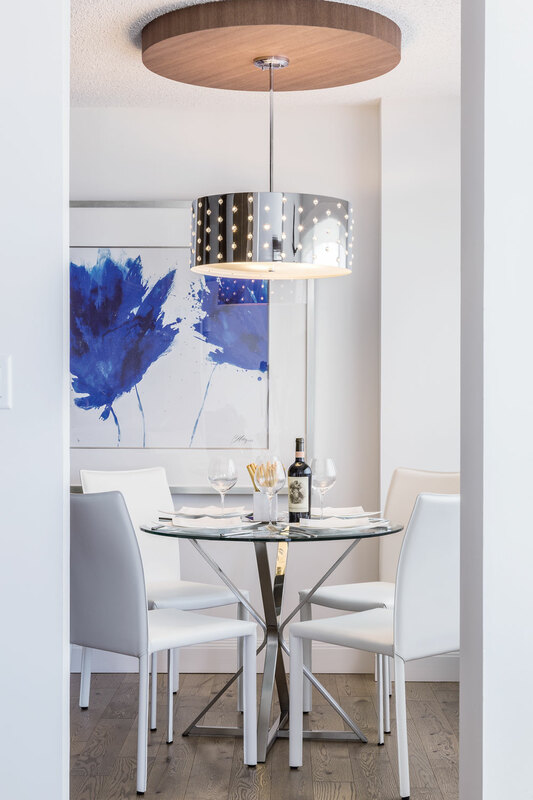 Along the way, he incorporated a few other approaches: a design that reflects the condo’s shore surroundings, a luxury hotel vibe in selected spaces and a strong artistic presence with bold artwork and a sculptural element in furnishings and light fixtures. 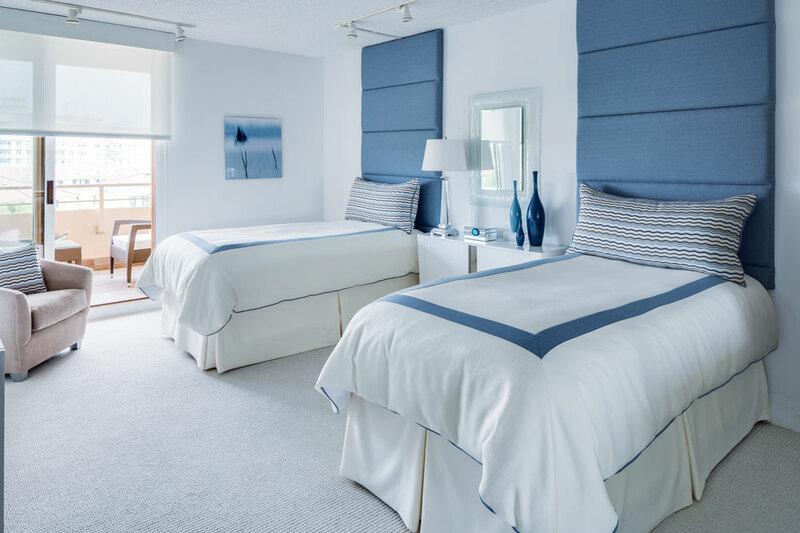 It all adds up to an accomplished rendition of a sophisticated, contemporary getaway for the homeowners, whose main home is in Livingston but who spend their summers enjoying time with family and friends at the beach. The purchase of the condo gave the owners a superb beachfront location with views to match in a building that includes a restaurant, gym, valet service and full-time security. The condo itself, however, didn’t live up to the building or its location. The interiors were the epitome of 1980s design—all peach and aqua—Acker says. A total renovation was in order, and the condo was gutted to pave the way for its new lease on life. One of Acker’s goals was to “take all the elements of the exterior and integrate them in the interior, namely the color of the sky and sand and the textures of the beach.” He chose natural materials and a color palette of crisp white, shades of blue and accents of taupe and brown that evoke driftwood. An example of this principle: an all-white dining room. White covers the walls, white glass tops the dining table, the chairs are white leather and the sideboard is white lacquer. The use of different textures—the lacquer and leather as well as a polished chrome starburst light fixture—provide interest and depth. Chocolate brown stepped molding and a medium brown hardwood floor ground the space and warm it up. Acker carried the same flooring throughout the condo and the same molding into the living room with its natural cotton sofa and chairs in a woven fabric combining lighter and darker shades of blue. The designer provided a bit of pattern with a light blue zebra print on two stools and on throw pillows. A white shag rug adds texture, as does a cocktail table with a sculptural base composed of walnut wood dowels with a taupe cast that echoes both floor and molding. The base is essentially a piece of art. Artwork, in fact, plays a major role throughout the condo. Acker commends the homeowners for their choice of art and the way it complements the overall design. The piece over the living room sofa, for example, features shades of blue that represent “ocean, horizon, calm,” Acker says. The designer chose another artistic element: the sculptural sconces that flank the sofa. To create that floating up-in-the-air feeling throughout the condo, Acker used not only the white and blue color scheme but also furniture—including the living room sofa, chairs and stools—that perches atop chrome legs. “Everything seems to float,” he says. A particular challenge in the living room proved to be another opportunity to fashion a “floating” element. The homeowners wanted a special place to recline, relax, read and just gaze out at the ocean, Acker explains. But that wasn’t immediately possible because the living room windows don’t extend to the floor to afford those ocean views. 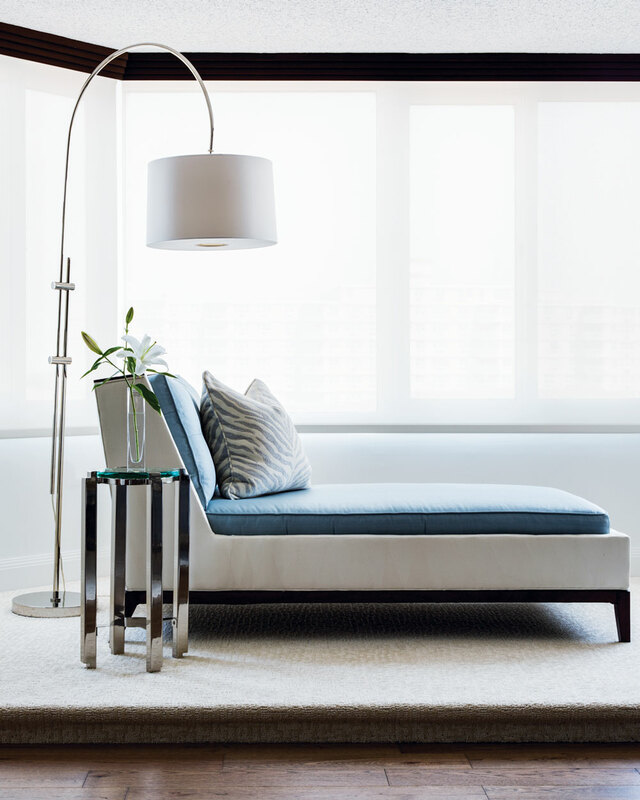 To solve the problem, Acker added a carpeted platform along the windows and placed on it a custom chaise with a walnut frame, white Ultrasuede sides and light blue cushions. The chaise, too, appears to float and, thanks to the platform, is high enough to allow ocean views. 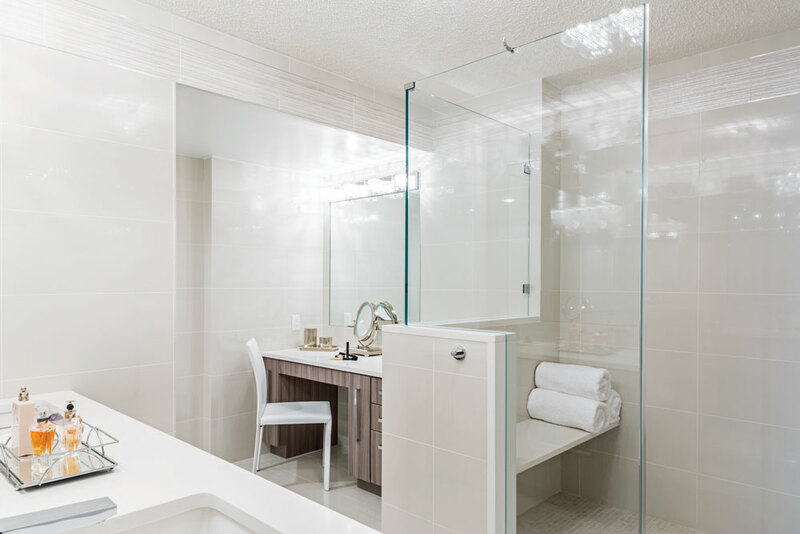 The designer took the condo building’s hotel vibe as his cue for his design of the master suite—a large, serene space with a luxurious bedroom and a tranquil, spa-like master bathroom. 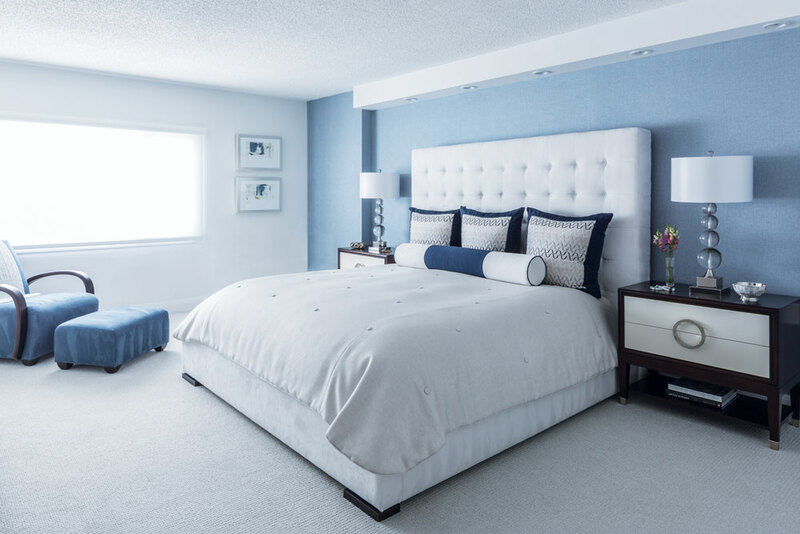 In the master bedroom, for example, a soft sky blue, tone-on-tone textured wall covering forms the backdrop for an upholstered and tufted off-white Ultrasuede headboard above a bed covered with sumptuous off-white linens. In the master bathroom, the designer replaced an antiquated whirlpool tub with an eight-foot long spa shower with a built-in bench and frameless doors. White 12-by-24-inch porcelain tiles on the walls and floor make for a clean, sparkling expanse accented by chrome hardware and light fixtures that strike a sophisticated, glamorous note. The spaces fit well with the rest of the condo. “I wanted to create a lifestyle that’s easy and simple for the homeowners to enjoy the summer, the beach and the views,” Acker says. Robin Amster is a Madison-based writer and editor. Overall: interior design, Acker Bryant Design in Deal; construction, trim and moldings, PDQ Builders in Toms River. Living Room: upholstered furniture, Thayer Coggin in High Point, North Carolina; cocktail table, Oggetti in Hialeah, Florida; area rug, Masland Carpets & Rugs; sconces, George Kovacs/Minka Group in Corona, California; artwork (over sofa), artist Florian Muller through YellowKorner Gallery in Short Hills; platform broadloom, Fabrica Fine Carpet & Rugs; chaise, custom; floor lamp, Regina Andrew in Riverview, Michigan. Foyer: console and mirror, DIA in High Point, North Carolina; accessories, Global Views in Dallas. Dining Room: table, Nuevo in Toronto, Ontario,?Canada; chairs, Euro Style in San Rafael, California; sideboard, custom by Cabitron Kitchen & Bath in Manalapan; light fixture, Arteriors in Dallas; artwork, Carlos Rodriguez (also known as subway graffiti writer Mare 139) in New York City. Kitchen and Breakfast Room: cabinetry, Cabitron Kitchen & Bath; backsplash and countertop, Ideal Tile in Freehold; light fixture over table, George Kovacs; artwork in breakfast room, Art & Frame Source in St. Petersburg, Florida. Master Bedroom: furniture, Belle Meade Signature in Collierville, Tennessee; platform bed, Lazar Industries in Siler City, North Carolina; lamps, John-Richard in Greenwood, Mississippi. Master Bathroom: tile, Ideal Tile. Guest Room: Upholstered headboards, M. Silberstein Interior Designs in Shrewsbury; lamp, John-Richard (T). Porch: flooring, Ideal Tile; furniture, Gar Products in Lakewood. T=To the trade.